Arm Training for Massive Gains is Here - Get Bigger Biceps in No Time! This article was originally published on #Bodybuilding.com. Think your “bad genes” are to blame for limited biceps growth? Forget about genetics, and focus on custom arm exercises that build thick biceps and mountainous peaks. If you’ve been hunting those large, peaked biceps but never seem to find them, you might be tempted to blame genetics for your problem. But instead of blaming your ancestors, how about taking another look at how you train? The fact is that you’ll never reach your upper limits of arm growth until you take a more strategic approach to your training. Stop relying on exercises that work the biceps the same way over and over. Instead, use these tips to customize your workout so you get the peak, the shape, and the thickness you want. Right off the bat, make sure you’re doing the most basic biceps exercise the right way. If you don’t curl correctly, everything else you do to customize your biceps workout will be a waste of time. People make the first mistake at the top of the range of motion. It may seem that the higher you lift the weight, the more of a biceps workout you’re getting. But as you lift higher, odds are you’re pulling your elbows forward and away from their position by your sides. If you are, you’re turning a single-joint curl into a multijoint exercise and bringing your anterior delts into play. If you finish the movement with your hands stacked directly over your elbows, you’ve taken all the tension off of your biceps. Don’t worry about how high you lift the bar. Keep your elbows locked by your sides throughout the range of motion (ROM). For extra benefit, contract your biceps hard at the top of every rep. This keeps more tension on your biceps and doesn’t allow you to rest within a set. The second form mistake is at the other end of the ROM; not fully extending your arms at the bottom of the curl. Lowering the bar by using lower-back extension and flexion might be great exercise for the lower back. But for the biceps? Meh. Do it by unlocking your arms as you drop the weight. In fact, if the area of your biceps just above your elbow shows incomplete development, it might be because you aren’t extending your arm enough. Keep tension on the muscle by retaining a slight flex in your arm as you start the movement. If you allow your arms to hang straight down, you’re pretty much giving your biceps a break. Completely extending your arms can also place additional stress on the elbows, especially if your arms are positioned against a bench, as with a preacher curl. By manipulating arm position, grip, and angle, you can shift the emphasis of a particular curl from the long head (which makes up what’s called the peak) to the short head (the inner biceps muscle) and even the brachialis, the muscle that lies beneath the biceps brachii. Why train the brachialis if it isn’t visible? Think of it as an inner tube: The more you pump up the brachialis, the thicker your upper arms appear. You just have to use a different approach than with conventional arm-curling movements. The key to brachialis growth is using a hammer (neutral) grip, which also hits the biceps long head. Arm-curling movements like preacher curls reduce tension on the biceps long head and are mainly for short-head development. Incline-bench curls, on the other hand, fully stretch the long head. Just keep those elbows back as you raise the weight! In general, a closer grip works the long head more, while a wider grip favors the short head. Try doing two sets with a shoulder-width grip, two sets out wider (a few inches outside shoulder width), and finally two sets with a closer grip (2 inches inside shoulder width on each side). Mix cable curls into your biceps routine, too. Because the line of pull comes from the side rather than straight down, cable-curl movements allow you to vary the point of greatest muscle stimulation to get multiple benefits from a single exercise. By adjusting the height of the pulley, or by facing toward or away from it, you can work your biceps in a variety of ways. Another common mistake is not starting off with the “right” biceps movement. Since virtually all biceps motions are single joint in nature, you might think it doesn’t matter which one you do first. Not true. For your first exercise, choose a movement that enables you to lift the most weight while maintaining good form. If you’re starting your routine on the preacher bench or doing concentration curls—both of which require the upper arm(s) to be stabilized to better isolate movement—rethink your routine. Heavy barbell and/or dumbbell curls are the best way to start your biceps workout. The following techniques stimulate your muscles much more than normal training. You can apply them to just about any biceps exercise to work the inner to outer biceps heads or the brachialis—or to hit more than one biceps area at once. 1. Peak-Contraction Training: Hold the top position for a count and squeeze your biceps as hard as you can. The extra tension is great. What’s more, the squeeze makes you stop and focus on the top movement instead of just immediately lowering the weight. 2. 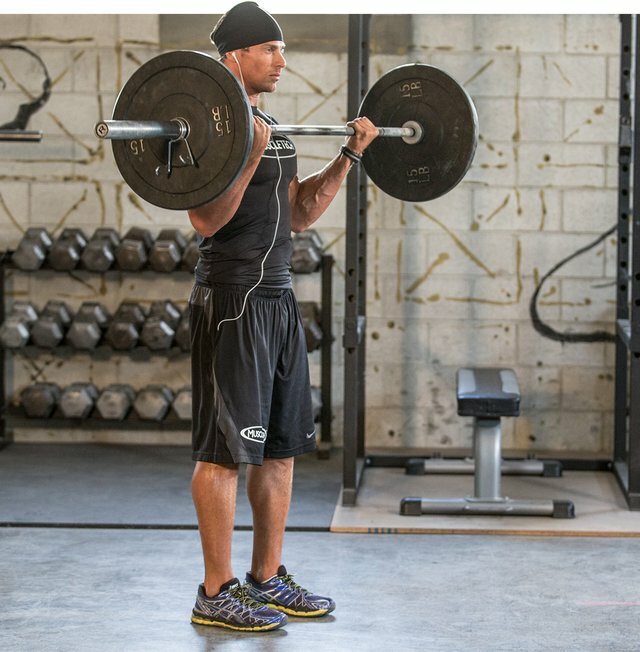 Partial Reps: Partials can be especially effective for working above the sticking point. Partial reps focus on the part of the range where you’re stronger and can lift more weight than normal. You can do them with seated barbell curls or by doing curls in a power rack. 3. Get Twice the Workout: Start the set at full arm extension (again, with a slight bend), then lift up to full contraction. Go just halfway down, come all the way up again, then go all the way back down to the start. You count the entire sequence as one rep, but you’ve gotten two contractions out of it. Boom! 4. Mix It Up With 21s: Start with seven half reps covering the bottom half of the ROM, then go right into seven more reps over the top half of the ROM. Finish with seven full-range reps, for a grand total of 21 reps.
5. Add Resistance Bands: When you do typical barbell or dumbbell exercises, your load is constant throughout the ROM. By adding a resistance band or bands to your curls, you increase the movement’s difficulty the further you stretch the band. This technique, known as variable resistance, makes the weight feel heavier at the top than at the bottom, giving you an opportunity for new biceps growth. 6. Increase Time Under Tension: Slow down the speed at which you lift by using eccentric or “negative” training. In this technique, your partner helps you lift a weight up, and then you take 4-5 seconds on the way down for more time under tension and to lengthen the muscle. You can use the same technique to work on the positive portion of the rep. Have your partner help you lower the bar, then use explosive reps or even slow reps for more gain. Combine both of these movements with blood-flow restriction and cluster-set training to get the biggest guns in town. But tempo doesn’t have to be limited to negative-rep training; so too can you work on explosive reps or even slow reps, both of which focus on the positive rep. There are still more technique you can use to stimulate better-than-average biceps growth. Supinating your hand as you curl a dumbbell, alternating workouts of lower reps with higher reps, and including finishing moves like FST-7 are all worth exploring. You can also create strategies that target the biceps twice during your training split or train them after a rest day. Ultimately, the best way to add inches to your biceps is to do less of what you’re already doing and more of what you’ve never done before. Think of yourself as both scientist and guinea pig, and start testing some of these techniques. Give each one about six weeks, pay close attention to how it affects your muscle development, then switch it out for another one. Think of it as an ongoing test of mind over matter, and of training over genetics! Friedmann, B., Kinscherf, R., Vorwald, S., Müller, H., Kucera, K., Borisch, S., … & Billeter, R. (2004). Muscular adaptations to computer-guided strength training with eccentric overload. Acta Physiologica Scandinavica, 182(1), 77-88. I'm a personal trainer and your friend who'll guide you regarding workouts, bodybuilding diet and more. Comment below my blogs and I will get back to you in no time!